We’ve spent quite a few posts on Sharp’s Android tablets, named Galapagos, in the past months. 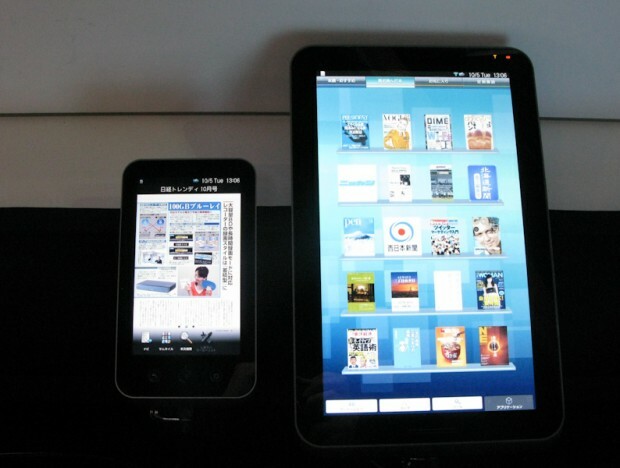 The 5.5 and 10.8-inch devices are marketed as tablet/e-reader hybrids, with Sharp having inked deals with Japanese publishers to offer books and newspapers to buyers in its home market. And today, various Japanese media are reporting that big S will bring both Galapagos devices to the US next year. Sharp also plans to sell the tablets in China, India, Brazil, and other places. The company says that buyers in these markets will be able to read books in the EPUB format (whereas Japanese buyers are restricted to XMDF, its proprietary format). Non-Japanese Galapagos models will also feature 3G (the Japanese ones come with Wi-Fi connectivity only). Sharp also said it will negotiate with publishers and content providers outside Japan to set up country-specific e-book stores. Prices and exact release dates are unknown at this point, but Japanese buyers currently need to pay $476 for the smaller model and $714 for the bigger one (including an 8GB SD card).